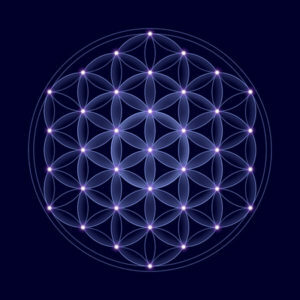 This post is to explain how important sacred geometry is in True Quantum Healing (TQH). Even, if you have not heard of sacred geometry yet, the chances are that you have seen it but was not aware of it. You can see evidence of it all around you, from the food you eat, within nature, in city designs, within your own body, even unto the stars. Basically, sacred geometry is like a language based on maths and shapes, like sphere, circle and pyramid. If you just look at the pyramids in Egypt, the sacred geometry within it is fascinating. So, all shapes have a certain mathematical structure and they all have energy, which carries a certain type of vibration. And it’s this vibration that we use in healing. The main sacred geometry tool that I use is the vesica pisces and it plays a very important role in TQH. It represents the divine feminine energy on the planet at the moment, since we’re in the age of Aquarius it and facilitates bringing in that energy. It consists of two pyramids base to base, surrounded by a sphere (and there’s other geometry in there also). The vesica pisces acts as a transmitter and receiver of Quantum energy and amplifies the healing allows the healing at deeper levels within your body. I also have a sun ring attached at the end which amplifies it even more. So during a long distance session, once I dowse to find where the problem is within your body and what is causing it, I use the vesica pisces along with my words and intent to remove the different energies. So, I’m saying the words, backed up by my intent and the vesica pisces is removing the energy of the problem. So, it’s the three components working together and It’s all based on quantum physics. Words and intent are very powerful in healing because Words are vibration and vibration is powerful and we can change energy with our intent. There’s two words very important in TQH when doing clearings. They are the words ‘true’ and ‘false’. I have had clients with migraines and one of the problems was calcium buildup and deposits. Just by saying the words calcium buildup and deposits false makes it no longer exist, the energy of the problem is basically cancelled out. Then by saying the word true, it raises the area that was effected to a higher vibration. So, when I’m doing the healing I am intending for a change being made at the energy level within your body to cause a change in your physical body. Clients usually feel a cool sensation or some kind of shift in energy after clearings. Another thing about the vesica pisces is that it also protects me while doing clearings. In other forms of healing, practitioners use their hands. I’m still using my hands to hold the tools, however, the tool is taking the brunt of the clearing. Another sacred geometry tool I use is the neutralization ring. It is based on sanganeevi design and the geometry is a circle with spokes pointing inwards and it neutralizes the energy in or over it. It’s purpose is to pull negative energies off the body. They come in platinum and gold and can be used separately or together. During a long distance session, I just intend the neutralization ring between your feet and it pulls negative energies off your body. Clients usually feel a swaying or pulling sensation or a cold feeling of something leaving their body. When using them together, I intend one between your feet and the other above your head. This creates a battery type effect as the platinum ring is more of a masculine energy and the gold ring is more of a feminine energy. They work at a deeper level to pull negative energies off and loosen things up or to pull off residue at the end of a session. So, that’s just the jist of how the sacred geometry tools work in True Quantum healing. Check out my long-distance neutralization ring healing video on my youtube channel and please subscribe for further videos and updates. If you have any questions or would like to book a session to see how True Quantum healing can help you the please visit https://nicolakb.com. I am willing to help anybody with any kind of problems.